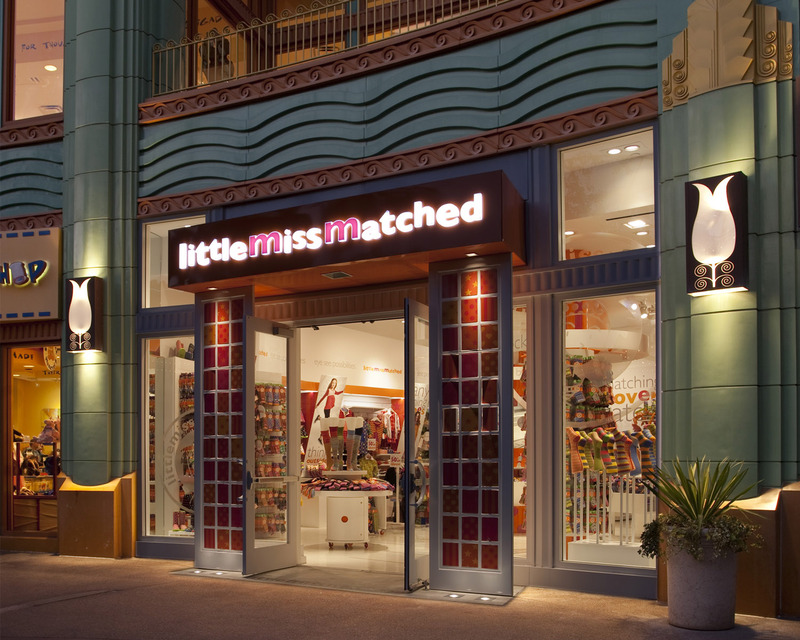 Whether for the tween girl or consumers who remain young at heart, the store encourages shoppers to buck convention and rules to create their own sensibility of clothing, home furnishings and design, or as they say, Think outside the socks.™ Just like the brand with its focus on fashion and fun, the store reflects a “conceal and reveal” perspective – a peek-a-boo look at patterns reflected in mirrors and finishes that reveal that everything is not evident at first glance. The store reveals the brand’s feel through a series of forms and shapes. These are iconic and functional like the Mixing Bowl where friends can meet, the Sock Troughs where the latest styles are displayed with try-on forms ready for mixing and matching, and even the cash wrap that uniquely places the customer and the sales associate side-by-side. Shoppers enter the store through colored patterned light projected on the entry floor.